Because the majority of the Canadian population is English-speaking and shares an open border with the US, the movie industry of the two countries have become intertwined. Most major studios also have a filming studio in Canada. Because of the complexities of the structure of the studios, to understand Canadian movie paper, please see Poster Distribution in Canada (above). 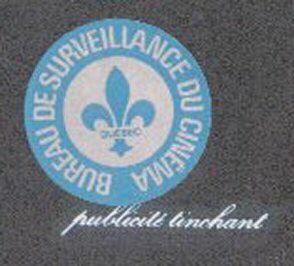 The major differences will come out of the Montreal Branch, where major changes were made primarily for the French posters. Quite often older posters that the studio shipped to Canada will have a stamp which was required by most censor boards. American or French movie posters that are printed and released in Canada do not have the Canadian sticker, but posters that are brought into the country do.